St. Joseph - Michigan - Stained Glass Inc.
A parish of the Archdiocese of Detroit, the St Joseph church was built in 1966. Linda Williams, the Parish Manager first saw Stained Glass Inc. windows on the internet and brought the idea to Father Stan and the church. St. Joseph's originally only intended to install 4 to 6 windows, but when the idea was suggested, donors stepped forward and within days they had sponsors for 27 windows. Designs were based on a combination of both traditional and contemporary stained glass art. The pastor selected the artwork from the online collection and then Stained Glass Inc. made it work with the window sizes provided. This makes the artwork unique to the church and a collaborative creation. 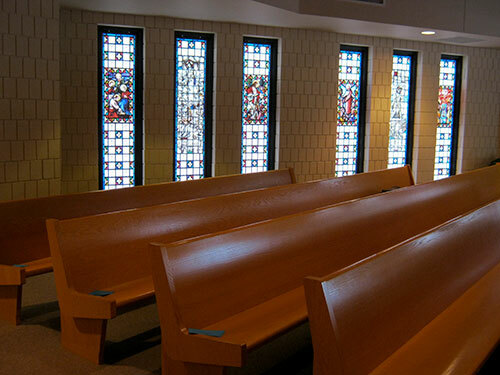 Windows were installed in the sanctuary, the meeting area and the chapel. The new windows eliminated distractions from passing traffic and glare. The windows created a noticeable reduction in outside noise and made the worship area quieter. All the window inserts were easily installed in 4 hours with no mess. The pastor, myself and the entire staff are just astounded at the beauty and quality of the windows. I knew they'd be wonderful, but the internet images just cannot compare to the color and detail of the actual product.